Hello Montreal! Some great style abounds in this lovely Franco-American city. I gave myself just today to capture some lovely and fashionable people. Hope you like them! Great coat from Forever 21. The brogue is still in this time of year as well. Love the red pants and vest, casual and chic. Like the tote as well! 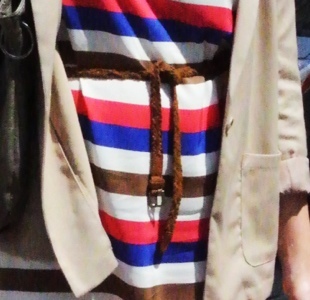 Like the colorful stripe dress. Especially love the way she did the tie belt. Great dress with a pop of color from that awesome vibrant bag! The sandals are hot as well!